There is a small grassy mound off Stewart Duff Drive opposite the road to the Moa Pt sewerage works. 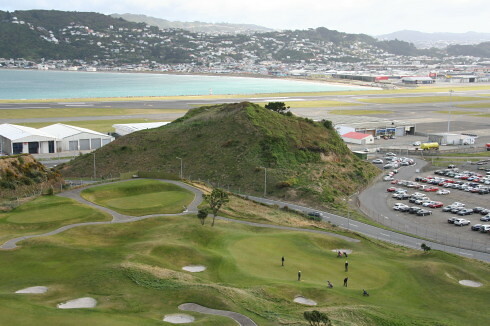 There is no defined track, but it is possible to scramble to the top for an excellent view over Wellington airport. Take care, as it is steep and slippy in places, especially after wet weather. I believe there are plans to completely remove it one day, so enjoy the view whilst it is there! Find a safe place to park somewhere on Stewart Duff drive, or in one of the off-street parking areas round the corner on Moa Point Road.